ABSOLUT Fringe is one of our favorite festivals in Dublin. We always go to a handful of events to celebrate cutting edge performers. 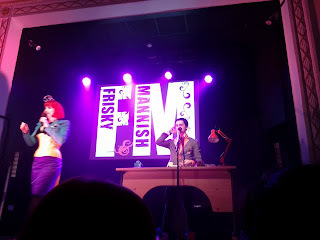 We started our 2011 Fringe odyssey with Frisky and Mannish' PopCentre Plus. We were ushered into a venue with mismatched chairs lined up in front of the stage. 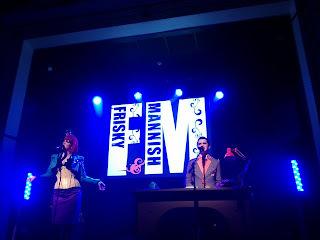 Neon lights and what looked like a school teacher's desk adorned the stage. 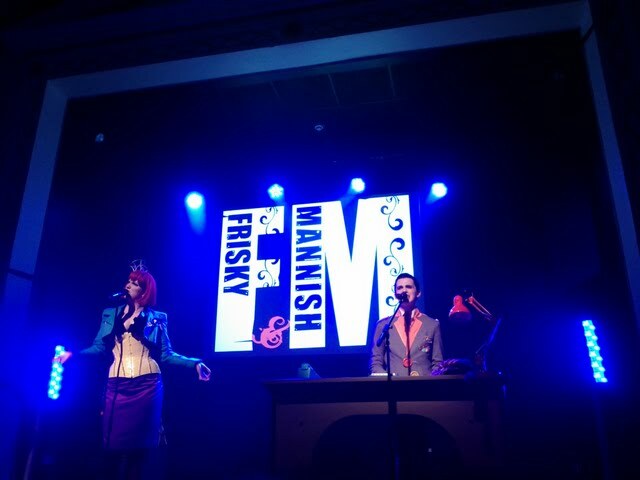 Frisky and Mannish reinvent pop favorites in delightfully hilarious ways. Skits ranged from making a 'twee' song 'grime' to reliving the 12 phases of Madonna set to Shirley Bassey. The funniest part was when they took a look at the elements of a boy band and put together Band Over with five guys selected for their varied talents from the audience. The exercise culminated in a photo shoot and performance. I captured some additional pictures of Band Over here. I think these guys have a future in the business!